The awesome ASIFA-Hollywood Animation Archive has started to transfer and share some of the most important (and long-hidden) animation of the modern age: The famous UPA commercials starring the Piels Brothers and their beer! click on the picture of Bert and Harry to jump to the downloads! At the ASIFA-Hollywood Animation Archive post you can download and watch a super-high-quality QuickTime movie featuring well OVER 7 minutes of long-lost cartoon footage from these incredibly influential animated spots. They look very simple, but UPA's Bert and Harry Piel cartoon commercials really broke new ground and set the stage for a whole new era of "modern" cartoons. ...and according to Steve @ ASIFA, this is just the first HINT of the treasures recently uncovered there! from Wikipedia: In the 1950s, the Piels brewery had a very successful television and radio campaign when the Young & Rubicam ad agency created Bert and Harry Piel, the fictitious animated owners and pitchmen for the brewery. Voices were provided by the comedians Bob and Ray. Harry (Bob Elliott) was tall and soft-spoken, always calming down the short loudmouth Bert (Ray Goulding) when something went wrong. 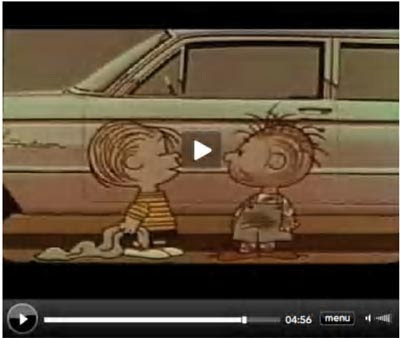 The first Bert and Harry commercials aired December 1955 and ran until 1960.
over at Pappy's Golden Age Comics Blog! Here's a nice treat from CartoonBrew.com ...in remembrance of Peanuts animator Bill Melendez, Jerry Beck has posted some animated rarities from the earliest days of the Peanuts cartoons. You can watch it below, but it's bigger and better on CartoonBrew. At the 2:30 mark of this video, (after a trailer for the first full-length Peanuts animated cartoon, "A Boy Named Charlie Brown,") we get to see the very first occurance of an animated Charlie Brown, Snoopy and company...animated by Bill Melendez for an opening on the Tennesee Ernie Ford Show. The voice of Charlie Brown? None other than Paul Frees! This is one of my favorite King Aroo strips so far...Yuptop gets dressed up and takes center stage, we got magic, and we get to have some fun with Mr. Elephant, too. Every panel has got that little special something that makes this strip a worthy companion to the gentle lyrical humor of Pogo and Krazy Kat. It's also fun to watch Yuptop got though all his emotions without even having a mouth! this one from March 9th, 1952! Click on any image for a BIG high-resolution comic strip scan! There you'll also find a list of links that talk about King Aroo creator Jack Kent and his works! Update: Many more King Aroo Sunday Comics scans right HERE. Update #2: Still MORE King Aroo dailies and Sunday strips HERE. "King Aroo is one of the most celebrated strips of the recent past in the comics ... appealing largely to the members of the readership that loved Krazy Kat, Barnaby, Pogo and Little Nemo. 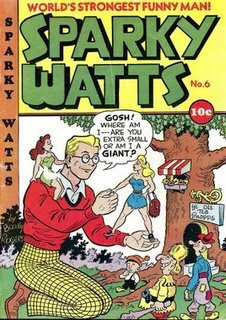 The strip began in 1950 ... but was discontinued after a few years. It was kept on in limited syndication until 1965." I recently made some hi-res scans of some color newspaper samples of the King Aroo strip that I collected a few years ago. Since there was only ever one book collection of the strip (in 1953) and very little merchandising, Jack Kent's King Aroo has been largely forgotten, except by a rabidly loyal group of fans that swears lifelong allegiance to the King. I have listed some links at the bottom of the post where you can look to find a few more strips, and a lot more information. The great Jack Kent and his wonderful "King Aroo"